Superior quality Binder Cane is the same as Chair Cane except that it is wider and thicker. It is generally used as the last step in hand weaving to cover the holes around the seat and as a wrap on wicker and rattan furniture. You also see it woven in a herringbone or basketweave pattern on porch rockers or other types of chairs that have rungs that can be woven around. 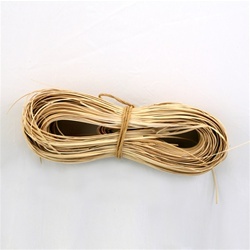 Binder Cane is available in 3 sizes: 4mm, 5mm, and 6mm. We also put up Binder Cane in the American selected long strand (all strands 12' and longer). The long strand is nice to use when weaving a porch rocker. Binder cane is used for wrapping the joints on rattan furniture, weaving seats that have rungs and as the final step on hand caned chairs.